Navigating Academia: A Guide for Women and Minority STEM Faculty explores the infrastructure of the academy and provides a systematic account of where and why women and minorities fall behind men in the preparation for and development of their academic careers. This book offers useful strategies for recruiting, retaining, and advancing women and minorities. Chapters include testimonials from faculty and administrators about how they made their ascent within the academy. 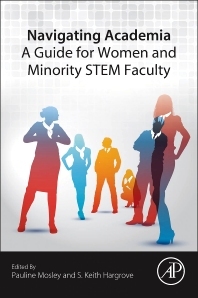 Navigating Academia: A Guide for Women and Minority STEM Faculty also discusses how to modify and expand faculty recruiting programs, how to diversify search committees, how to encourage intervention by deans, and how to assess past hiring efforts. This guide is an important resource for women and minorities seeking success in the academy as well as for administrators focused on faculty and professional development. Outlines barriers and challenges that this population is confronted with and provides several solutions and approaches for combating these issues. Includes insightful testimonials from contributors at various stages in their academic careers. Identifies critical success paths of a Professional Support Network (PSN) and pinpoints what components of the PSN are needed and how to acquire them. Women and underrepresented groups pursuing or involved in an academic career in the STEM fields; Secondary market includes those in the Humanities as well. Additional markets include administrators, academic policymakers, and professional women’s organizations in these areas as well as those involved in professional development training and workshops. What is a Professor Support Network?